We’re glad you stopped by! We promise you’ll find a soap that meets your needs and delights your senses! We’ve got everything from just plain soap to soft and subtle to downright flirty and sassy! Beth’s Kydz Sudz is a family endeavor built on the foundation of hard work, determination and most of all, tender loving care. We take the extra time to make our soap in small batches giving the utmost care to each and every bar down to the very last detail . . . because after all, it’s the little things that matter most! Go ahead and sit a spell, get cozy and look around – you’ll be glad you did! Want to get to know a little more about us? Visit “About Us” or check out our blog. You’ll find lots of adventure, musings and heart and soul there! Wintertime provides the luxury of free time during the cold blustery days to dabble with some new soap! So far we are loving this one! Bright, yet deep and mellow with orange oil, patchouli and a touch of sandalwood. Chopped calendula gives it some character! 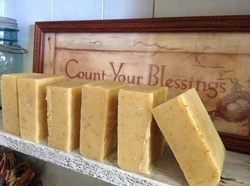 Thinking of calling it Blessings as it seems to partner nicely with the reminder to Count Your Blessings! Our new favorite! Lavender Mint! It's refreshing and crisp while yielding all the calming comfort of lavender. 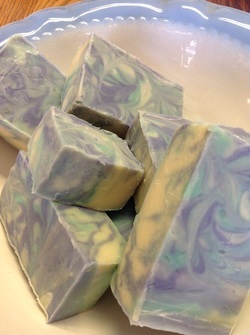 Brightly swirled with lovely lavender and mint green to bring out the theme a bit more. Cannot wait to offer this one on our market table this summer!